LG revealed its 2017 OLED TV lineup in January at CES, but the company did not yet disclose the price or actual release date of these new TVs. A few days ago we found some initial information on Amazon.com, and today Robert Zohn from Value Electronics updated us with more details. Below you can see the release date and price of LG's entire 2017 OLED TV range, except the entry-level B7 TVs. Roberts though says that LG may of course change the release dates. 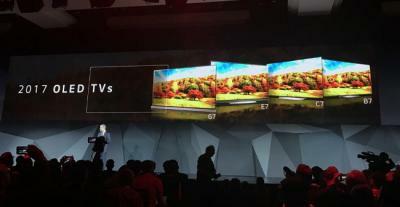 Prices may also end up lower than official prices, this has been the case every year since LG launched its first OLED TVs in 2013. These prices differ somewhat with what Amazon listed last week, but Amazon does not list the prices anyway (you can still see the pages here, though: 55" OLEDC7, 65" OLEDE7, 65" OLEDG7. LG already launched the Signature OLED W (wallpaper) series in Korea - the 65" is already shipping for 14 million won ($12,300). All prices listed above are correct with the exception of the following three models that were reduced. Also the 65" C7 is delayed one week so it is now scheduled to ship the week of March 6th. W7s are now available! Will Samsung start selling OLED TVs in Korea next week? What new OLED gadgets will be unveiled next week at the IFA tradeshow?